The Way of St. James or calling it by its more famous name “El Camino de Santiago de Compostela” or simply “the Pilgrims Way”. However you call it, now that we are three days into it, it is rather daunting! As neither Beverley nor I had done much (any) training (yes I know we were supposed to have done so but life got in the way!) we decided to just start walking on the 5th instead of the 7th and gradually build up our endurance. Good idea and its working well – for some sense of well. The first day wasn’t too bad, we walked from St. Jean P de P to Valcarlos approximately 12 km. 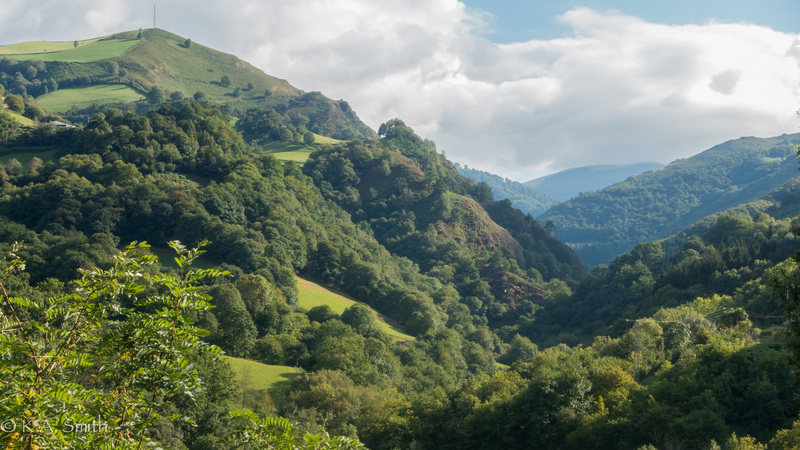 The forests and valleys are bucolic with fat fluffy sheep; tall, blond and muscular cattle – Charolais maybe? – and everything neatly manicured to within an inch. Reminiscent of pictures of Swiss Alps for some reason. We crossed the border into Spain at an outlet mall of all things, had coffee and meandered on our way – easy peasy! Day two was quite another story but it started off deceptively beautiful. Splendid forests of oaks, chestnuts interspersed with groves of tall pale beeches. Old growth trees with lawns of grasses which would be spectacular swaths of rich bluebells in spring and thick verdant moss over everything. We were dealing with a gradual rise in elevation about 150/200 m. over 3 or 4 k. Then the last 4.3 k. we went from 400 to 1,055 m! It just never ended; we worked our way past wild bramble hedges full of tantalizingly out of reach blackberries, navigated 30 cm. wide paths with serious drops to the left and were reduced to walking a 100 paces then resting, walking 100 paces etc. At the worst we were down to 50 paces and then resting. We kept following the power lines as they snaked their way up the mountain hoping it would end soon but it never seemed to. I think without Beverley I might still be up there somewhere! Well probably not but it would have taken much, much longer! 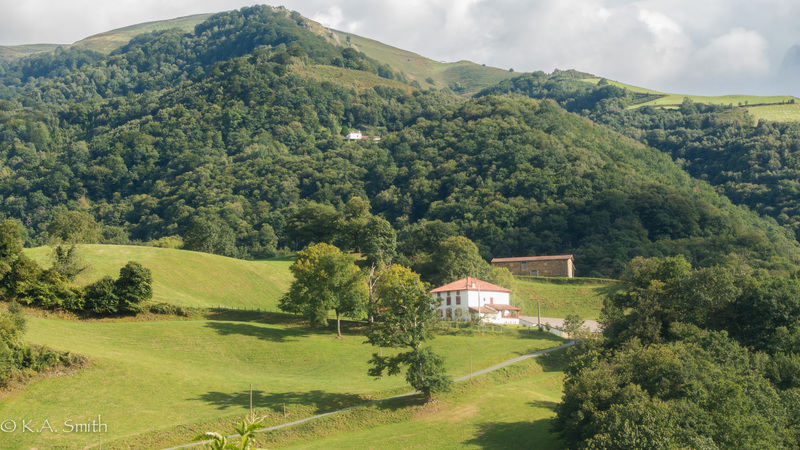 Roncesvalles announced itself with a small windswept church at the summit where we threw ourselves down, propped our legs in the air, gnawed on some salami and dates and guzzled the last of our water. I suspect our unorthodox behaviour was ignored because there have to have been lots of other travellers who have done the same thing! Downhill a bit into the village proper and we found a turquoise (EEK!) room with twin beds and private bath! We did manage to get a nap in, cleaned up and then a couple of enjoyable hours sitting on a patio with a lovely rosado, people watching. Highly entertaining! 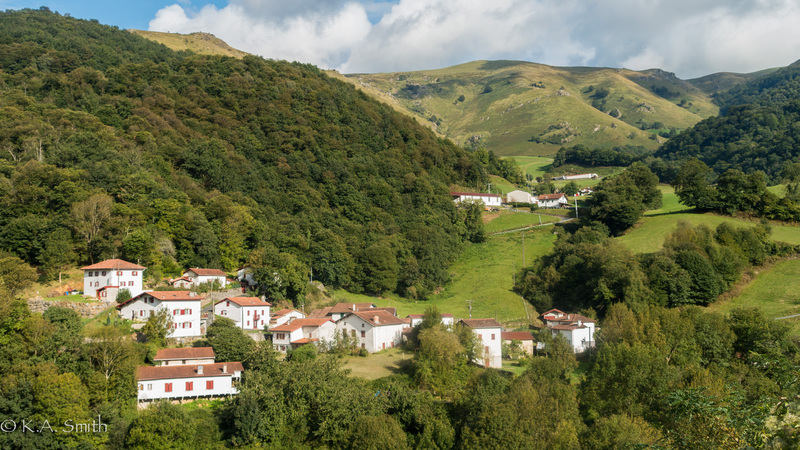 Roncesvalles, of the “Song Of Roland” fame is actually tiny – 60 souls – who probably all work to look after the pilgrims. There is a huge refugio (a kind of hostel/dormitory for adults) attached to the church – which is itself massive, a museum with Roland’s famed horn (which we didn’t see) and thats about it. . Dinners are served en famille – everybody thrown together at big tables and it was surprisingly elegant and good. White table clothes, three courses (one of which was a perfectly pan fried small trout) and the local wine! Today was easier in some respects though both Beverley and I are sporting blisters – hers are much “bigger and better” than mine and general soreness from yesterdays exertions, although most of the way has been downhill – which is much tougher on the knees and shins as we have discovered. We have now made the unforgivable mistake of looking ahead at our route and so have an inkling of what lies ahead. I am a bit depressed and very daunted by the distance and days ahead of us. I “know” that I have to just take it one day or even one step at a time but at the moment it stretches endlessly ahead and we don’t have as much time to dawdle and take in the sights as we would have liked. So – I will get passed this funk – I want to, I need to and I will. Just bear with me for a bit I think. Besides the most amazing thing has happened which is incredibly heartening (I will keep this in mind) – we have surpassed our fund raising goal for the Joe Homan Charity in India!!!! Yippee! Thank you to all of you who have already supported us and to those who are yet planning to! We have just walked 19 km. with absolutely brutal footing but we made it AND made some important discoveries – they are always sitting there patiently waiting for us to see them…. In our focus on completing this journey we forgot that it is about the journey NOT the destination. So we are going to stay at a pace that suits us, see the sights that suit us, do the things that suit us – and if we don’t make it all the way to Santiago de Compostela before we have to head to other places (London) so be it. How incredibly liberating and it completely eliminates my anxiety! There is always next year and perhaps we will have other company then too! I cannot up load the rest of the photos – there just isn’t enough bandwidth but I will do so when I can – bear with me – as usual – LOL!! You girls ARE competitive, even down to your blisters 😀. Whilst sitting comfortably sitting at my kitchen table, I do miss the experience you are having. An unforgettable time, enjoy the journey. 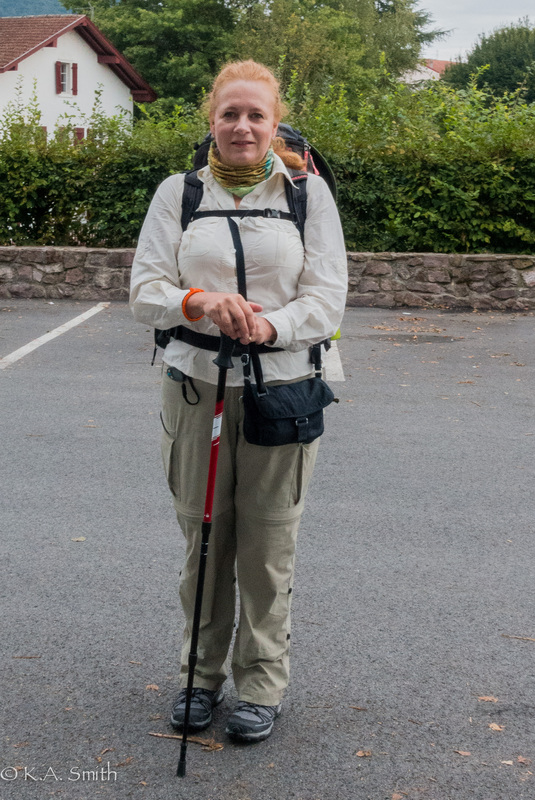 Wonderful to read this Blog, so thrilled to be part of the journey, blisters and all! Day by day,me joy the journey, it’s not about the destination you are so right!! !